Natasha Howard had been a reserve in the WNBA Finals the past three seasons. This year, she played a starring role. 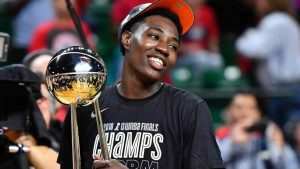 Howard had a career-high 29 points, plus 14 rebounds, in the Seattle Storm’s 98-82 victory over the Washington Mystics in Game 3 on Wednesday. A February trade sent her to a franchise that needed her exact skill set. And her experience with the Fever and the Lynx in previous WNBA Finals showed in how well she played throughout this year for the Storm. After 13.2 points and 6.4 rebounds per game during the regular season, she averaged 15.8 PPG and 8.3 RPG in Seattle’s eight playoff games. But it didn’t look as if it was ever going to happen when Hughes retired after the 2016 season. The chance to come back in 2018 with a championship-caliber team was something Hughes couldn’t pass up. It meant getting to coach a veteran leader like Sue Bird, an MVP-caliber star like Breanna Stewart and — at last — a player like Howard, with so much potential waiting to be realized.